Then turn to deep dark tan. Until the great war came. I’ll fight for home and State! Please bring them back some day. Crest: An arm in armor embowed, holding in the hand a broken tilting spear: proper. Foster Arms: Argent, a chevron, vert, between three bugle-horns, sa., stringed, gu. 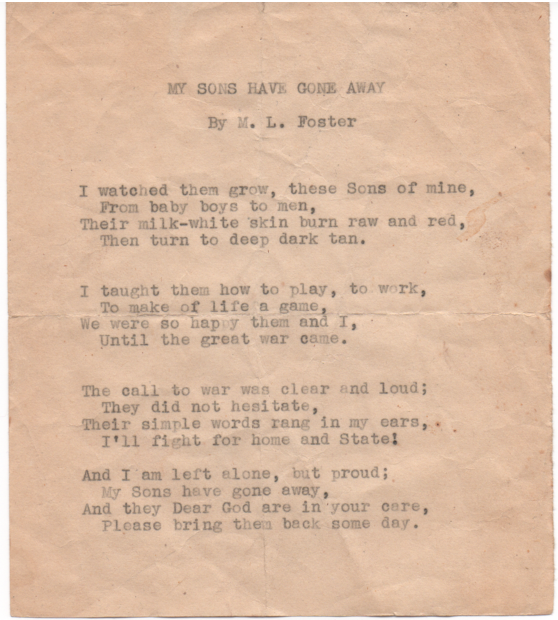 Below is the original scan from the book. This is possibly one of the most stained, most worn pages in my copy of the book, showing the Foster Coat of Arms page is clearly also one of the most beloved pages in the book. Embowed – the arm is bent at the elbow. Proper – the way it appears in nature. The armor would be colored silver or gray, to match the way it appears in its natural coloring. Argent – Silver or White. The “Field” (background) color would be represented as either silver or white. Chevron – The ^ shape across the center of the shield. Vert – Green. The color of the chevron. Bugle-horns – In heraldry, bugle-horns are the sign of the forester or hunter. sa. – Sable. Black. The color of the horns. gu. – Gules. Red. The color of the strings. Upon further investigation, I also discovered that the “helm” (or helmet) shown below the Crest is specifically a Jouster’s Helmet in style on the particular Coat of Arms chosen by our branch of the Foster family. This hints that the “broken spear” could, in fact, be a “broken lance” indicating Victory. Not all Foster Coats of Arms show this particular helmet, nor do all of them contain the broken spear in the Crest. To my knowledge, all Fosters however claim the Family Motto, Si Fractus Fortis, in some definition or other. 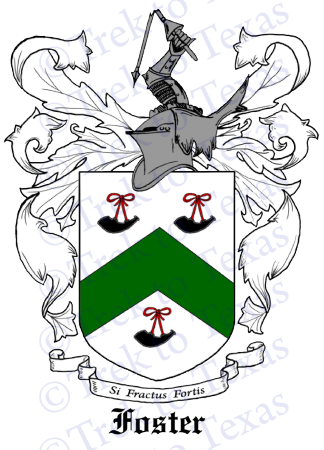 Below is my own drawing, recreating the full colors and details of the Foster Coat of Arms. The drawing is available for sale on CafePress on t-shirts, steins, mugs, prints and more. 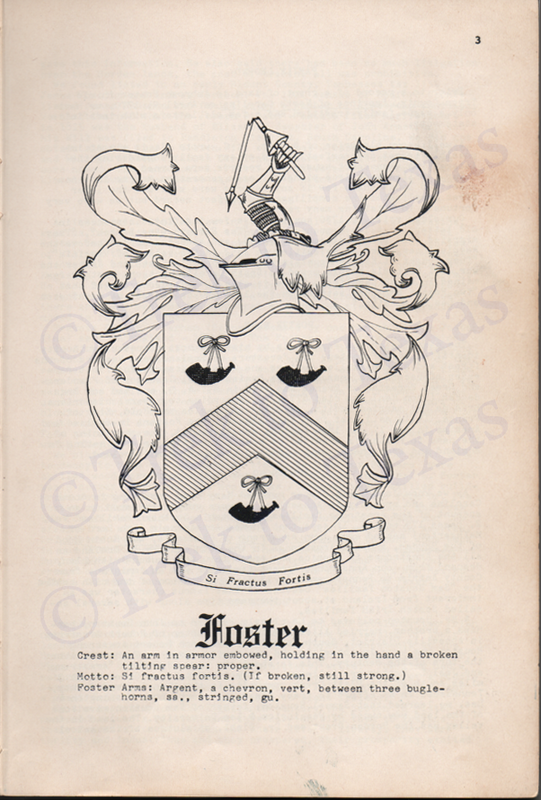 If you would like to support our site at Trek to Texas, purchasing your own copy of the Foster Coat of Arms would be a great way to help support the site. Copyright © 2010 Trek to Texas ~ 1770 - 1870. All Rights Reserved.